Should Energy Companies Ripping off Customers be Nationalised? Ofgem, Britains' toothless energy regulator announced today what customers already knew that Britians' six main energy suppliers (British Gas, E.ON, Scottish Power, Scottish & Southern Energy, EDF Energy) are ripping off their customers to the tune of more than £170 each per annum. 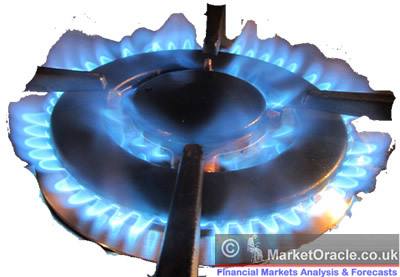 In the face of a 75% fall in the whole gas price energy suppliers have raised prices by 20% on a year earlier, this is AFTER a 35% price hike during mid 2008. The industry representatives have publically replied that they may even raise energy prices further despite the fact that average wholesale prices for power has halved over the past 12 months which is reflected in projected profits for the sector of £4 billion over the next 12 months. So whilst the Labour Government has been busy nationalising the bad debts of the bankrupt banks, the energy providers have collectively sought to rip off their customers, whilst employing smooth talking spin doctors to calm public anger. However the facts of the abuse of monopolistic powers where any bad trades often called hedging are being more than offset by overcharging retail customers. Since nationalisation is now government policy, perhaps the inept Labour government should in its dieing months make it a priority to nationalise the profitable energy sector monopoly in the interests of the public good, for once the Conservatives get in power that will no longer be an option. A quick alternative to nationalisation may be a one off tax on the sector that can help to fill the huge gap between government revenues and expenditures that has mushroomed to more than 12% of GDP putting Britain in it's worst financial state since the Second World War. Unfortunately for ordinary Britians the only solution is to selectively INVEST in the energy companies to capitalise on the sectors monopoly profits.